This freezer might be a little smaller in size, but it still holds a great deal! It keeps things super cold, and I've never had a problem with the temperature. We moved it across the country, and when we arrived, cleaning was easy before we plugged it back in. The basket in the bottom allows you to really fill up and utilize the space. The shelves in the door are strong and hold a lot, and the arms that hold it in haven't broken yet, like other freezers I have had in the past. This freezer has given us zero trouble, and I look forward to keeping it around for a long time. The smaller size helps it to fit in tighter places, but I don't feel limited in what I can store in there. It's a great compromise for someone who needs more freezer space, but doesn't have a lot of living space. I have truly enjoyed the freedom that the extra freezer space brings, and didn't have to sacrifice a large amount of my house to make that happen. This is a fabulous freezer that does a wonderful job! It features a digital temperature control that can be locked in place. It also has an alarm that alerts you when the door is not closed. This is a most convenient feature. The door also comes with a lock which is a great safety feature with little ones. However, my older ones have figured out how to pick the lock with just a finger (so if you think you are going to hide treats in the freezer and keep it locked forget it!) My only complaint is that the door of the freezer doesn't always open easily ( I suspect this has something to do with the lock feature which really was not perfected by the company). That being said, the inside of the freezer is lovely, organized, large, and very easy to clean. It is a strong and sturdy product. I bought this Frigidaire upright freezer to be able to store more frozen food than my primary refrigerator/freezer could acomodate. It's exactly what I needed - ample space inside with several shelves to hold lots of frozen food. I like that it has a temperature alarm, so you know when the freezer has reached an unsafe temperature, and it also has a "door ajar" alarm to alert you when the door has been left open. On the downside, the freezer alarm could be a bit louder, as it's difficult to hear if you're not nearby. 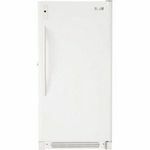 This freezer is fairly easy to clean, and the doors wipe clean with a wet cloth. We haven't had any problems with ours in the three years we've had it; all in all, a great appliance. Chilly, just as it should be! I was unsure about buying an upright freezer. I remember my grandmother always loving her chest freezer and saying they were the only ones worth using. For years I beleived that as well. But when my last freezer died I was in the market for a new one. I have to admit the final decision came down tio a simple matter of what was cheapest at the time, and this one was on sale. So I took the plunge and bought upright. I so do not regre it either. It takes up less room in my pantry, it seems to store more, and the ease of getting to the food is soooo nice. No more stacking endlessly onto each other and hoping what I want is on the top. Now I can easily find a frozen meal, a dessert, or whatever I want. I highly reccommend this! 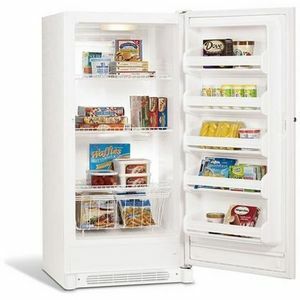 My husband and I recently purchased a Frigidaire upright freezer so that we would have more storage space for frozen food. For a "full" size freezer, it doesn't have too large of a footprint, yet it is very roomy inside and able to store lots of food. We keep ours in the garage and have had absolutely no trouble with it so far. One of the best features is that it has an alarm on it. If the door is left open, the alarm will go off and the freezer will beep at you. This is an especially great feature if you have kids who may not get the door closed completely. You also have an optional door lock, which you can use if you're needing to keep kids out. Besides the shelves inside the freezer, there are also little shelves on the door, which adds to it's capacity. The biggest drawback we have found to this freezer is that it is not the best energy efficient freezer, so once you start using it, you will probably notice a difference in your energy bill. I love my fridgidare 13.7 cu feet freezer. This is one of the best purchases we made for our house. We currently store it in the garage and have had it for two years. I love that it has an alarm on it so that if the door is kept open it will beep. This has saved me once when I accidently thought the door was closed. It holds plenty of food and it keeps it cool the same on top and the bottom. I like that there is a basket that pulls out on the bottom. There is also ample storage of the door. I think it is a very good appliance and a happy that we purchased it. So far it has worked great as a second freezer and I hope that we have it for years to come! This freezer hold all meat and frozen vegatables that I get on sale and there is plenty of room. It is very quiet in the garage and doesn't get buildup of ice on the shelves. I am very happy with it! I think it is a great freezer for the money! 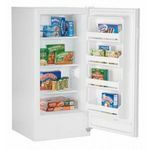 Frigidaire Upright Freezer is a cool choice. Has Electric Temperature Control located outside the freezer. To keep the temperature setting from being accidentally changed, the control can be locked.Temp Alarm is a feature that warns you that the inside temperture exceeds 23"F" It also has a Ajar Alarm this warns you that the door is pen for more then five minutes. There will be a beep every five seconds and the 'Door Ajar ' indicator will light up.Press "Alarm Reset" to turn alarm off. Has a interior light so you can see what you are putting in or taking out. Has adjustable shelfs. 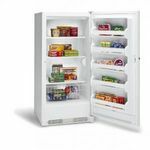 also has a Soft Freeze Zone for products like ice cream.Your appliance comes with a one year limited warranty. I love my Frigidaire Freezer! 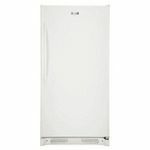 Though we have only owned our Frigidaire Upright Freezer for 3 months, we are completely pleased with its performance!! I love how it holds SO MUCH!!! It runs smoothly and quietly, you wouldn't even know it is there, but it keeps our food WONDERFULLY!! I cannot say enough- the next time we buy, we will definitely consider Frigidaire first!